The landscape surrounding the Windsor Casino in the City of Windsor, Ontario, Canada displays a large fountain, green landscape and stairs leading to the entrance. 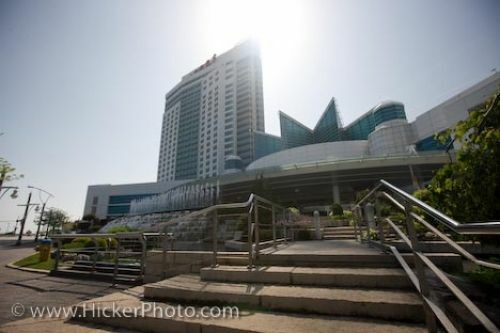 The landscape of the Windsor Casino, now known as the Caesars Windsor Casino in the City of Windsor, Ontario is kept up to first rate standards with the greenery, stairwells and large fountain which flows near the entrance. The casino was built in 1998 and reaches 27 stories in height and is constantly being remodeled to keep up to modern day standards. The sunlight sparkles off the rooftop of the Windsor Casino and the bright blue exterior of the building glistens across the landscape. A new 400 room hotel tower has been added to the four diamond star hotel, a 5,000 seat entertainment centre, 100,000 square feet of convention space, restaurants, shops and bridges linking the buildings with renovations still in the works. Picture of the beautiful landscape outside the Windsor Casino in the City of Windsor, Ontario in Canada. Fountain at the entrance to the Windsor Casino in the city of Windsor, Ontario, Canada.